This last week, people threw rocks,bottles, and even eggs at the Japanese Embassy in Beijing, the capital of China. Japanese cars were vandalized in China. Some Japanese stores and factories in China shut down because they were attacked or were afraid of being attacked. People in China were staging protests against Japan. Why were the Chinese people upset with the Japanese? It’s all about 5 islands and 3 reefs, located in the East China Sea. These islands and reefs are called Senkaku Islands by the Japanese and Diaoyu Islands by the Chinese. The islands have a total area of about 7 sq km (3 sq miles). In 1895, Japan claimed these islands. At the time there was nobody living on them. Japan also claimed the island of Taiwan. After World War II, Japan gave up some of the land that it had taken over. For example, it gave up control of Taiwan. Some of the islands that Japan owned came under the guardianship of the United States, and Senkaku (Diaoyu) Islands were part of that transfer. In 1971, these islands came back under Japan’s control. In the 1970s, four of the Senkaku (Diaoyu) Islands were sold to a Japanese family called the Kurihara family. In recent years, the Japanese government has been paying the Kurihara family rent for using the islands. Earlier this month, the Japanese government struck a deal with the Kurihara family to buy three of the islands. This has caused a tiff between the Japanese and Chinese governments and has led to the protests in China. China claims the Senkaku (Diaoyu) Islands were part of China’s territories since ancient times, and should have been returned when Taiwan was returned. Another twist is that while China claims ownership of the island of Taiwan, the people who live in Taiwan claim that Taiwan is an independent country. 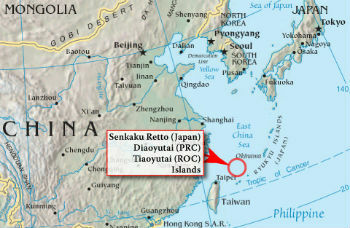 Not only that, people in Taiwan also claim Senkaku (Diaoyu) Islands to be their property. There is a reason that there is a fight for the islands. The waters around the islands are great for fishing, and could also have oil and gas. This is not the first time that these islands have created problems between China and Japan. Just last month, some Chinese boats made it near these islands causing friction between the two countries. These aren’t the only islands with ownership disputes in the area. Close by is the Scarborough Shoal, a group of islands and reefs in the South China Sea, which is claimed by both China and the Philippines. Parts of the Spratly Islands, in the South China Sea, are claimed by Brunei, China, Malaysia, the Philippines, and Vietnam. The Paracel Islands, also in the South China Sea, are claimed by Vietnam and China. In fact, in July, China established a new city called Sansha on one of the Paracel Islands, an event that made Vietnam unhappy. The disputes in the area are not only about ownership of land or the water body. They are also about the name of the water body. The Philippines wants part of the South China Sea to be renamed the West Philippine Sea. Here is a map showing these islands. China and Japan are the second and third largest economies of the world (according to the country’s gross domestic product (GDP)). The GDP of a country is the total value of all the products and services that are produced by the companies and the people of that country over a year. China and Japan are trading partners and both countries make money by selling products to each other. The United States is the world’s largest economy.